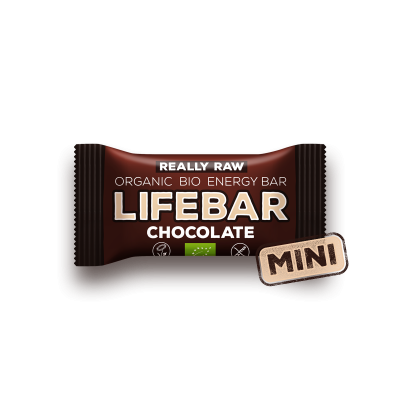 MINI Lifebar is a nutritional snack bar in a handy pocket size format. 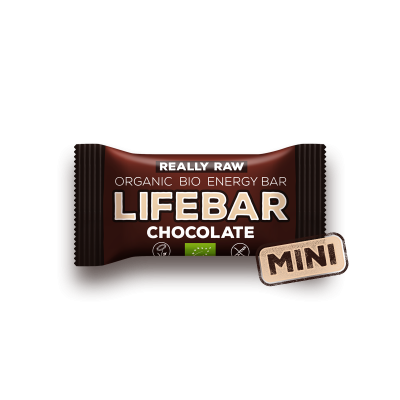 Created specifically to fit in your favourite bag, MINI Lifebars offer the highest quality nutrition and balanced energy to tackle life challenges. With only 100 kcal and a super delicious taste, it is your perfect snack for any time of the day - just keep your bag stocked up with them and may they become the secret to your success. Dates*, Nuts* (26 %; Almonds*, Truly Raw Cashew Nuts*, Almond Paste*), Raw Chocolate* (9 %; Raw Cacao Powder*, Raw Cacao Butter*, Cacao Content 100 %, Cacao Butter Content 33 %).